On March 21st, the first day of spring, in many Polish cities and towns one can see groups of children traveling in different directions. Could they be celebrating the official day for “skipping school”, very popular in Poland, providing freedom from the burden of studying? Maybe so, but many groups of children are accompanied by their teachers, and they are on their way to a river, lake, or pond to drown a “Marzanna”. “Marzanna” is a doll symbolizing the bad, long winter. She is made of straw, hay, cardboard, and rags. Dressed in a colorful skirt or dress with a scarf on her head, she is placed on top of a long stick and later is drowned in the river or lake. Children carrying “Marzanna” participate in a colorful parade singing songs. The last person in the parade is a child carrying “Gaik”. “Gaik: is a symbol of spring. It is a tree branch decorated with ribbons and artificial flowers. Drowning “Marzanna” in a river, lake, or pond is accompanied with the singing or saying of the following words: “Marzanna, Marzanna, swim across the seas. Let flowers bloom, and fields turn green.” Tradition of drowning “Marzanna” goes back many centuries. In Poland, it started over 1000 years ago during the reign of King Mieszko I. Jan Dlugosz first recoded it in the 16th Century. According to him, the ritual started with destroying of pagan gods, as instructed by Mieszko, and as a sign of accepting the Christian religion. Other historians believe that the custom is late medieval and was geared to stop the “black plaque” that swept that country site during this time. 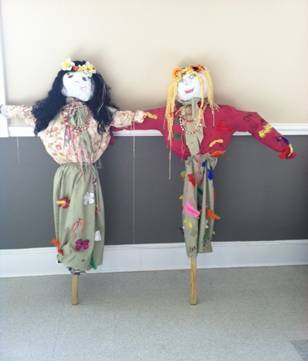 In old Poland, girls carried “Marzanna” through every street, ending up outside of town. There, the doll was undressed and thrown into the river. Without looking back, the girls returned home. 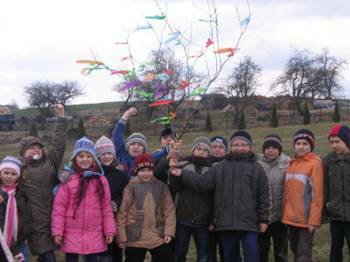 To replace “Marzanna”, the boys carried a large, decorated branch from a pine tree called “Gaik”. Today, it is believed that “Marzanna” and “Gaik” are rituals of destroying the symbol of winter and the rebirth of life and nature. It is related to old, pre-Christian, spring customs of making an offering, spanning the whole Europe. Staring in 19th Century, adults began to take part in these traditions. With time, the drowning of “Marzanna” lost its initial sense of magic and turned into play, which will remain in Poland for a long time as the proper way to welcome the first day of spring. Nowadays, drowning of “Marzanna” is prohibited in Poland due to damage of the biological environment.